Let’s be honest here. Vans doesn’t have the reputation of putting out the most technical skate shoes in the market. Instead, the company is known for their deep-rooted history in skateboarding with Tony Alva, Stacy Peralta and the Z-boys handpicking Vans as the perfect skateboard shoe to shred in during the 70’s. Known for their durability and thick rubber sole, Vans shoes back then had already figured out the long lasting formula of creating a suitable skate shoe. But over these 50 years…skateboarding has only gotten gnarlier. With more technical tricks, larger stairs, and bigger handrails, skaters nowadays are in desperate need of more technical designs adapted for the gnarliness of modern day skateboarding. With a team stacked with heavy hitters like Geoff Rowley, Tony Trujillo, Chris Pfanner, Kyle Walker and Curren Caples, Vans knew they needed to produce a skate shoe model that could take the wear and tear across the board from stair stomping to flip-in flip-out skateboarding. Now in the more recent years, the Pro Skate line was introduced, and technologies such as Duracap and Wafflecup were taking on momentum as the more technical elements featured in Vans’ skate shoes. But just this past month, Vans flipped the script and revealed the most technical Vans Pro Skate model to date, the Ultrarange Pro. The silhouette of the Ultrarange Pro will be the first to catch your eye; the shoe almost looks like an athletic trainer or even looks like it’s design took inspiration from running shoes. But don’t let it’s exterior fool you, the Ultrarange Pro is outfitted three major technical elements to make skateboarding in 2017 as comfortable as possible; there’s Duracap for reinforced durability, Luxliner for enhanced stability, and finally, a co-molded outsole that decreases the weight of the shoe without sacrificing cushioning. We were given the opportunity by Vans to not only test the shoe, but to also hold an industry Weartested event in Shanghai, China. 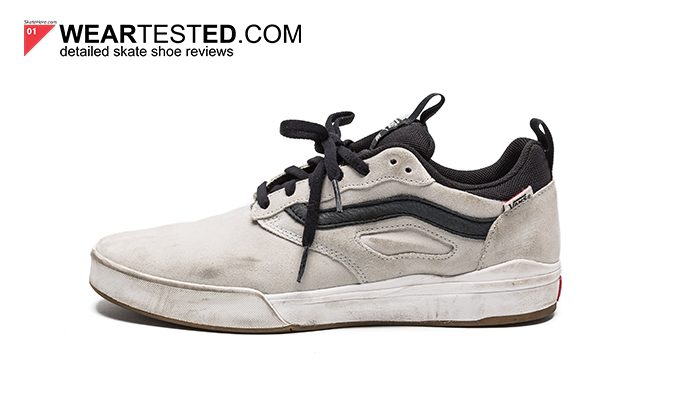 Check out the review below to see how the shoe fared, and then peep our recap video to see some of China’s local rippers skate up the Ultrarange Pro. The Vans Ultrarange Pro fits true to size. 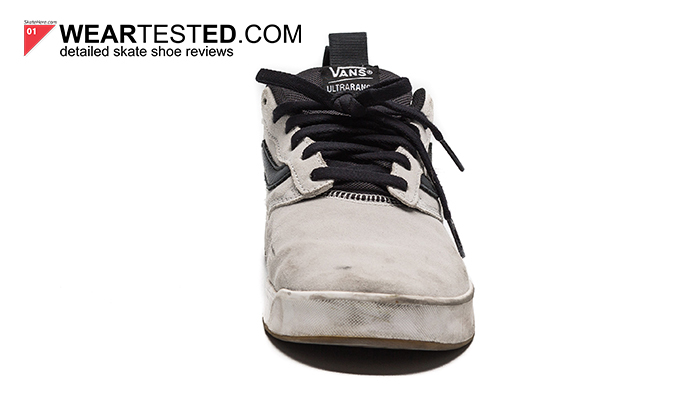 The durability of the Vans Ultrarange was the least of our concerns when it came to the weartest. Similar to the Vans Gilbert Crockett 2 that we tested back in March, the Ultrarange Pro was outfitted with a layer of Duracap rubber in the first third of the shoe. If you look at the shoe, you can also notice a small ripple effect underneath the suede near the first eyelets, which is as far back as the Duracap goes. The thin rubber layer of Duracap reinforcement is not only there to act as a second layer of abrasion defense, but it also helps to hold up the structure of the toe cap area, and provides a bit more protection than most shoes with one thin layer of suede. No blow out spots occurred during our weartest since the side wall’s seams were pushed a bit back away from the usual Ollie hole area, and even better, no laces were ripped. All in all, the durability of the shoe was good; the suede didn’t wear away much and even when it does, the shoe has enough structure underneath the suede to prolong its lifespan. The shape of the Ultrarange Pro is quite narrow; the heel to the midfoot area slims down, and then widens out around the forefoot area before tapering into a pointy toe. Interestingly, when you wear the shoe, it feels quite comfortable similar to a slip-on. As mentioned earlier, the toecap piece also has a slight ripple effect, which is just the presence of the rubber Duracap layer beneath the suede. 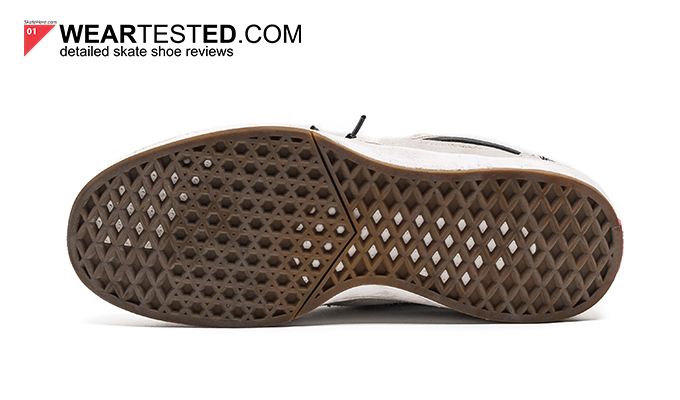 One thing that was a bit different than other models tested was the rubber outsole’s shape. The overall outsole was quite contoured, with the heel area of the shoe’s outsole protruding a bit that helped with heelflip tricks. 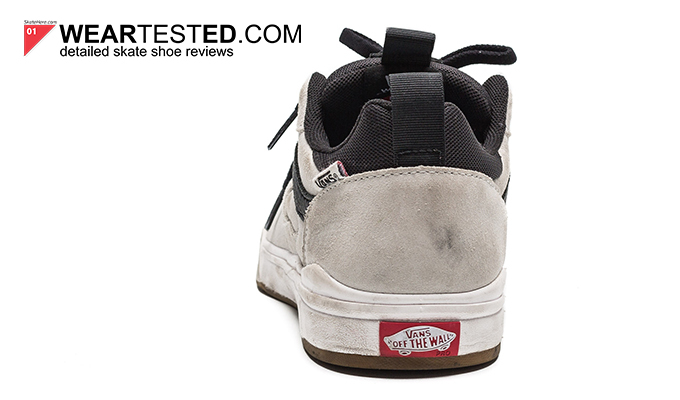 The outsole around the toecap area was shaped a bit convex, which made have been designed on purpose to let the grip tape catch more edge of the shoe when it came to flip tricks. Although the technical elements of the shoe make the Ultrarange Pro seem like a narrow and sleek running inspired skate shoe, the overall shape and fit was quite comfortable and wider than we expected. Just for reference, skateboarding shoes have always been battling between cupsole outsoles and vulcanized outsoles. Cupsole models can provide much better cushioning, while vulcanized models can provide much better boardfeel and grip. While the majority of Vans’ Pro Skate models have a vulcanized outsole, the Ultrarange Pro is a cupsole model whose marketing has really been focused on it’s cushioning and impact protection. When we first saw the shoe, we assumed that it would be quite thick and bulky, and since cushioning was a highlight of the shoe, board feel would be sacrificed. However, after skating the shoe for about four hours, the shoe was finally broken in, and the boardfeel was great. 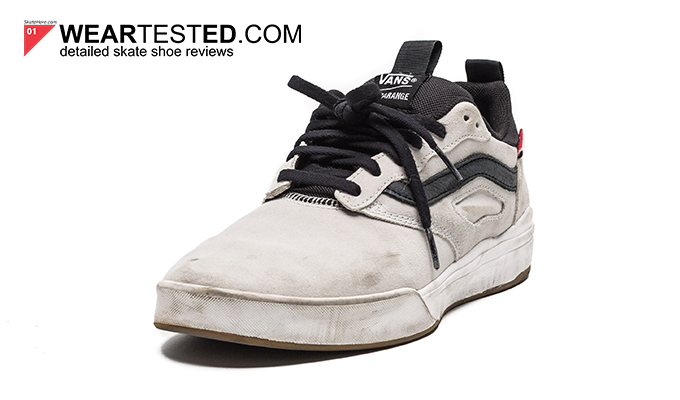 It helps that Vans chose a thinner and lighter Ultracush Lite instead of Ultracush HD to make their midsole, which made it easier to feel out the concave of the board. 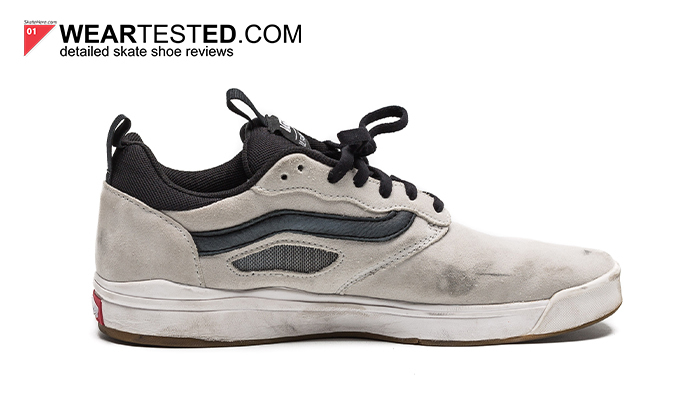 The initial grip of the outsole was fair, but didn’t maintain its grippiness during all 10 hours of skating like previous vulcanized models have. 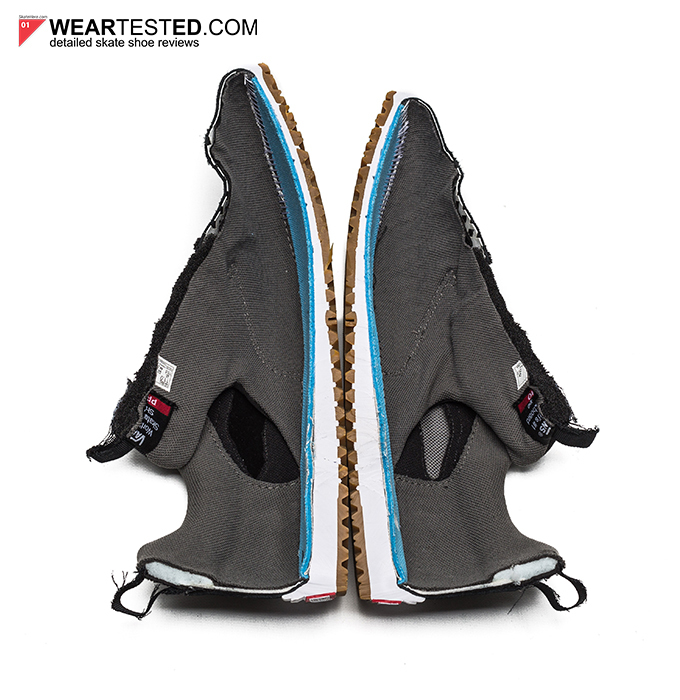 With that said, the waffle sole was similar to other models and was extremely grippy with no blow out holes during the weartest. 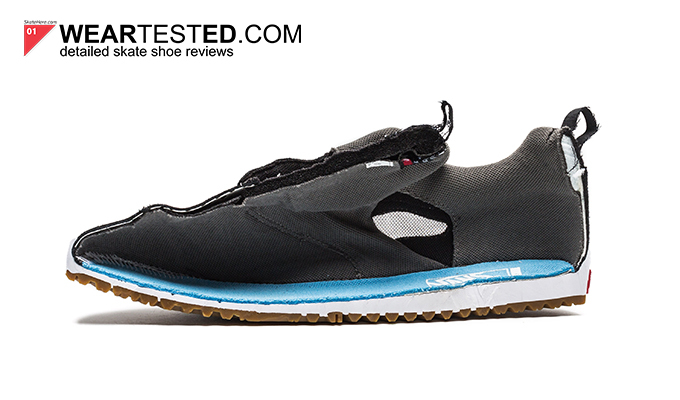 Now we’ve come to a part of our review where the Ultrarange Pro’s truly impressed us throughout our 10-hour weartest. To start things off, the Ultrarange Pro was extremely light, and breathable. The medial sidewall features a mesh panel that allows hot air to flow out when your feet get sweaty from skating. Moreover, the inside of the Ultrarange Pro features a seamless sock-fit construction called Lux-Liner, which is essentially a tongue that features tongue centering straps which connect to the sidewalls of the shoe. This Lux-Liner construction knocked the ball out the park for two reasons. First, it centered and stabilized very well; when it came down to jumping off sets, the shoe did not slip around to mess up our flick and catch. This stabilizer also helped control the impact of landing by directing the shock as central to the Ultracush Lite as possible, which prevents heel bruises. Moreover, the Lux-Liner construction was made of an extremely breathable mesh/silk material that also allowed heat to escape through the tongue. Sweating while you skate in the summertime is unpreventable, but the Ultrarange Pro’s breathability and Lux-Liner construction helped tone done the blistering heat. Whatever you do, don’t judge the Ultrarange Pro by its look. 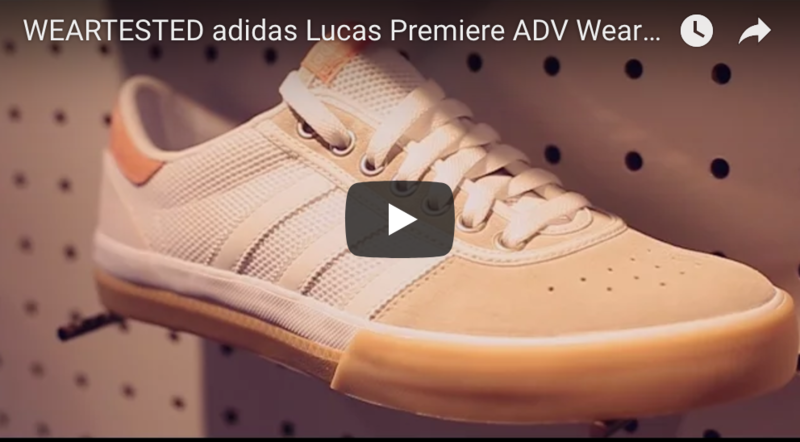 This is a technical shoe adapted for modern day skateboarding that excels when it comes to comfort, durability, stability, and cushioning, but could use a bit more improvement on boardfeel and grip.